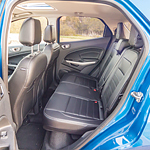 Ford EcoSport: Compact Crossover With Comfortable Amenities | Jimmy Michel Motors Inc. Unveiled on the North American auto market in 2017, the Ford EcoSport is a small crossover SUV that offers good value in comfort and performance. Having five seats in two rows, this lightweight model is designed for family travel in urban and suburban areas. The Cold Weather Package significantly improves the comfort inside the EcoSport. This signature package includes a de-icer for the front windshield to improve your visibility of the road on a cold day. Insulated floor liners and a heated steering wheel are some other features that are included with this optional package. Select trims could be furnished with leather upholstery and durable cloth inserts for the ultimate comfort. Visit Jimmy Michel Motors Inc. to buy your next Ford crossover SUV in Aurora. When you come to our dealership, you could check out the S, SE, SES and Titanium trims that are available for this compact crossover SUV.